The race itself wasn’t special, even though it takes place each year in his birth city in association with Maine’s largest seafood festival, but it was the pursuit of an interesting racing trifecta that focused the attention of CRR Mark Deshon this summer. 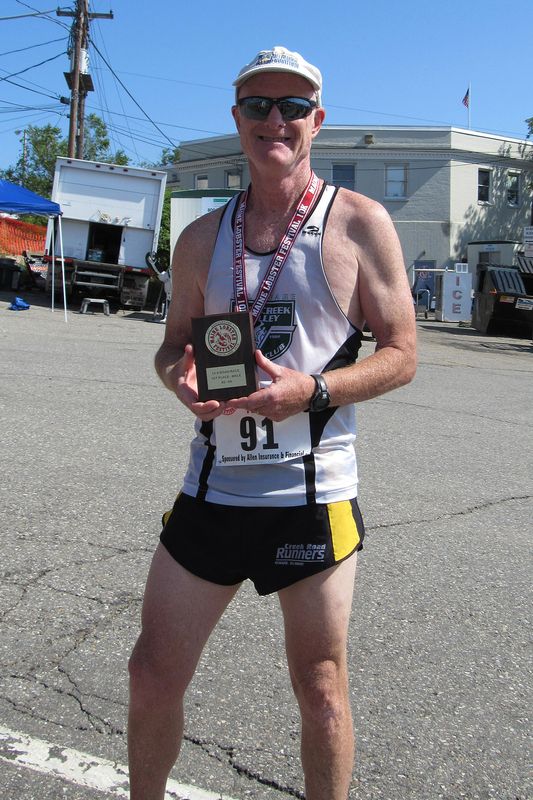 After last Sunday’s race, Deshon, who first took on Rockland’s Lobster Festival 10K in 1997 during its silver anniversary year, has now competed in the race three times, winning his age group each time—in different 10-year age groups. Despite what he viewed as a sub-par race performance (“I was on [my target] pace but completely blew up after four miles”), Deshon managed to finish 19th this year in 45:34, winning the 60-69 age group’s first-place plaque. He now has his third such winning plaque, having finished 6th overall in 1997 at age 41 in 37:47 and 21st overall five years ago at age 57 in 43:56. Inevitably (like “death and taxes”), his times have slowed, but Deshon happily relishes this special—in a quirky sense—racing achievement, 21 years in the making.